Black Panther is easily the most hyped movie of the year. Granted the year is young, but I’d bet it holds the title. I was a little concerned when bought the tickets, and all the seats were open. Admittedly, I bought them two days early anticipating difficulty. Not to mention the showtime was 3:45 pm on a Sunday and in 3D. Still, it made me question the validity of the hype. I mean a 99% on Rotten Tomatoes is crazy. I shouldn’t have worried because the movie is great. You already know I’m a huge comic book nerd so you shouldn’t be surprised. Even though I knew Black Panther the comic existed, I had never read one. Like most of the world, the movie introduced me to Black Panther. Sarah Finn is the casting director and absolutely crushed it. The acting is some of the best I’ve ever seen. Chadwick Boseman portrayed King T’challa passionate, cautious, decisive and humble. Every quality you would want in a King. The antagonist in the story is Killmonger. It’s hard to classify Killmonger as a villain, and I suspect it is because Michael B. Jordan is so charismatic. The guy is hard to hate. Killmongers cause also hits very close to home. He is essentially making the case those with excess should help those with nothing. The method he wanted to use to push his agenda was villainous, and for that, he had to be defeated. 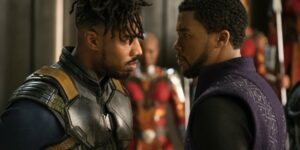 I’m sure many in the audience could see killmonger’s perspective. The women of Black Panther were also cast to perfection. I expected Danai Gurira to be magnificent and I wasn’t disappointed. Danai owns the screen in The Walking Dead, and Black Panther was no different. 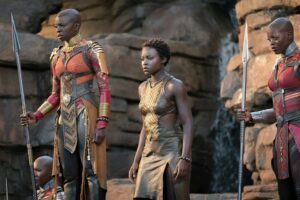 Lupita Nyong’o plays the reluctant queen to be Nakia. Lupita conveyed Nakia’s inner turmoil of loving T’Challa while also wanting to be out in the field helping the rest of humanity. For me, the standout character was Shuri played by Letitia Wright. Letitia gave Shuri a ton of depth. If Tony Stark needed a partner Shuri would be a shoe in. I love it when the snarky techy can grab weapons and go fight with the rest of the team. Speaking of technology, the tech was awesome. The suits (yes plural) we as epic as an Iron Man suit. The use of vibranium and the power it gave the suit was plausible. The only part of the technolgy I don’t really understand is the healing tech. 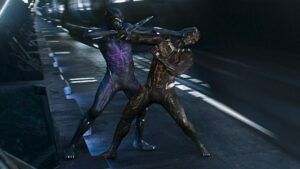 Does vibranium heal humans? Are they using the plant that give Black Panther his strenth? It seems to reason Wakandin medical technology advanced at a faster rate because all the supporting technolgy advanced. Marvels movies are typically not sewn with life questions and lessons. The writers took a Super Hero and decided to entertain while they educate. Much like Super Man, Black Panther is a role model for all people.